Fresh crispy autumn air did not give the Unicheck team a respite. After a busy summer, we just kept on laboring, trying to give you the best experience with the Unicheck similarity checker. Today we are proud to present something entirely new: interface design and functionality. 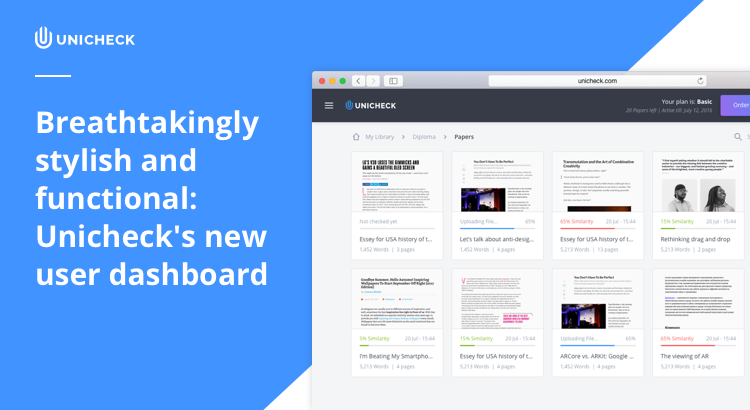 This is what you can discover inside Unicheck’s new user dashboard. We are so hyped for you to try it out in action that we give each new signed up user 5 free pages. The new dashboard is packed to the brim with smart updates and exquisite add-ons. So buckle up, and let’s explore it. The first thing you’ll see after you sign in is Unicheck’s onboarding tutorial. 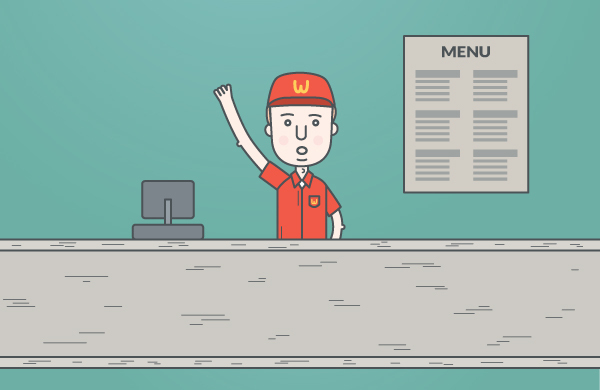 This is our step-by-step guide that will swiftly tell you about all the user dashboard perks. You can spend a few minutes with it, or skip it as you please. It will remain accessible in the main menu, so that you can get back to reading whenever needed. When you are done, you will land in your Library. Here you will find our sample document report. 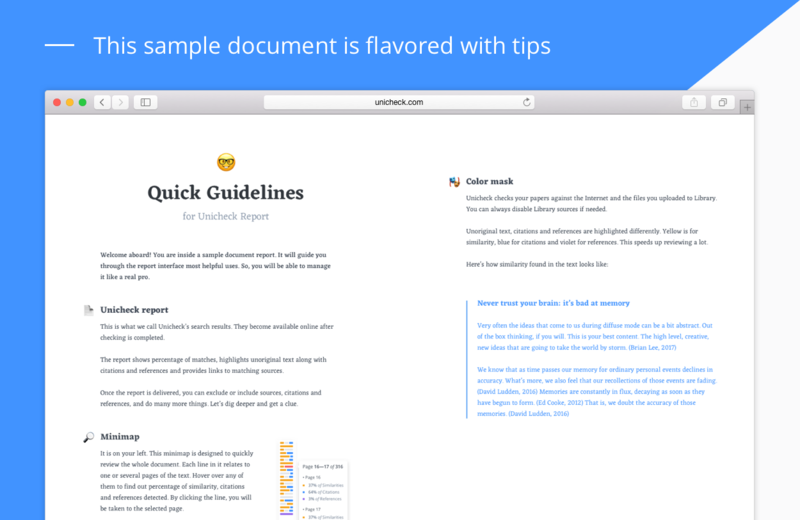 The document is already checked for similarity and flavored with some handy tooltips. 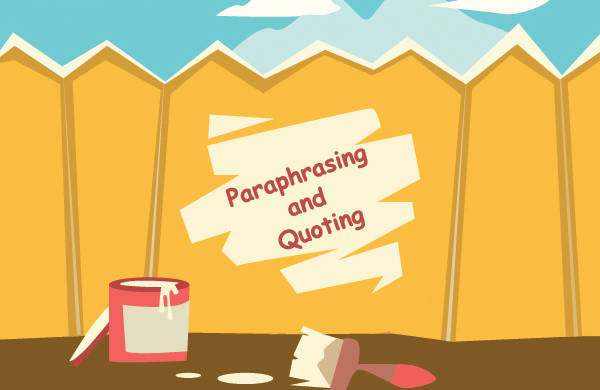 They will prompt you how to manage a list with matching sources, download reports, disable Library sources, and more. The way you view and arrange uploads in your Library has changed. There are two buttons now at the lower-right corner of your dashboard. 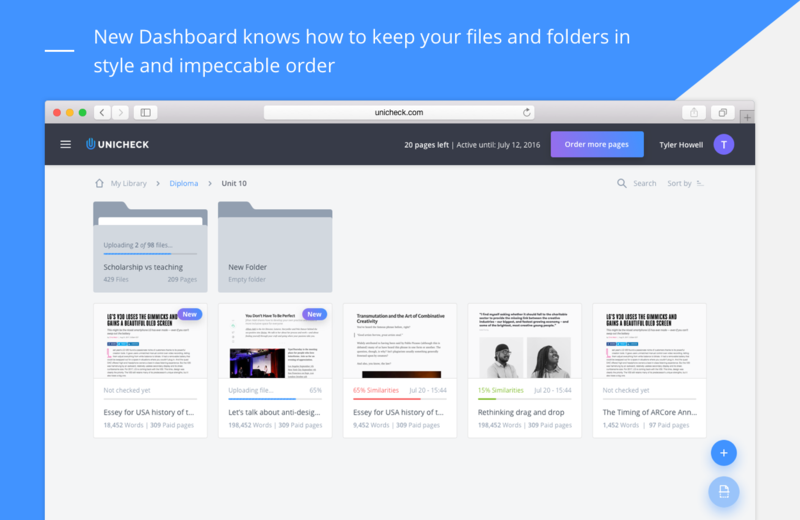 The upper button lets you create and upload files and folders. Still, you can drag and drop them too. To organize files and folders, just use the overflow menu on each of the file or folder for that. The lower button checks for similarity. To check one file or folder select it and hit the Check for similarity button in the lower-right corner. To check multiple files or folders, select several of them and hit the button. The tiles on your Library will display if the file was or was not checked. This saves time and helps you stay organized. Unbelievable news for those who was looking for a way to do checks with archived files and save time at the same time. From now on, Unicheck supports archive formats like .rar and .zip. What is more, you will not have to spend time manipulating your archive: just upload it, select it and run the check. No more actions needed as Unicheck will do everything for you. To learn the new layout and nuances of Unicheck’s similarity report, you may open the sample document again. We have added breadcrumbs, to let you navigate with ease and go back to any part of your journey. As there is only one document in your Library so far, your breadcrumbs will only be able to take you back to the Library. To the right from breadcrumbs, you will see your document’s status and color legend. The colors show similarities, citations, and references. The color mask is displayed over the text of the document, but just as usual the formatting of the document remains unaltered. To the left from the checked document is the minimap. It will always appear after the document is checked. 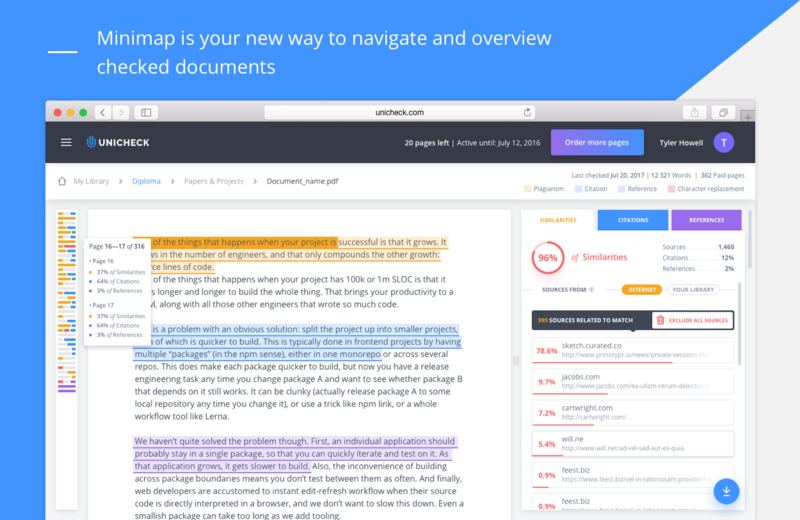 The minimap is here to help you review your document at just one glance. Each line in the minimap represents one or more pages, depending on the size of the document. If you hover over a line, an overflow window will show the exact percent of what was found on the page. If you click on the line, the document will scroll to the page you chose. All the details concerning similarity, citations and references are displayed to the right from the document, and organized in three neat tabs. In Similarity tab, it is easier than ever to perform any actions like viewing internet sources for matches, viewing sources, or excluding them from the report. Citations tab displays all properly formatted citations that Unicheck has found. By default, detection of citations is enabled. So, they won’t badly effect your total similarity score. You can exclude any citation if needed, and this sentences won’t be treated as quoted material. The same actions are allowed for References tab. When it is on, Unicheck won’t consider it plagiarism. Both your checked document and the tabs are resizable. To adjust them, just click on the handle between the text and the tabs and move it to the left or to the right. 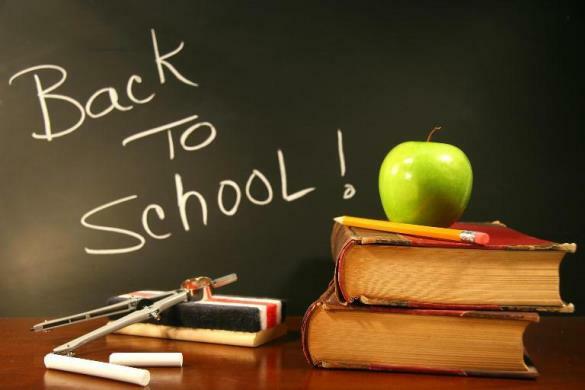 As ever, Unicheck can perform checks in any language that uses Latin or Cyrillic alphabet. Using live web index, we provide the most up to date accurate results and check against billions of pages and open source repositories. Don’t forget Unicheck is available as a Google Classroom app as well. So, sign up and see how amazing it is. You are going to love the new user dashboard, we promise. Сlown? Zombie? What Study Monster Is Haunting You?